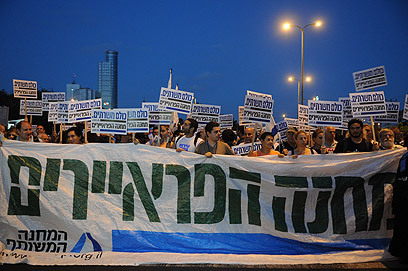 'One people, one draft' – Some 12,000 people including IDF reservists, disabled veterans, social activists and politicians gathered Saturday night in Tel Aviv Museum Plaza in order to call for universal draft and an equal distribution of the burden. The protesters are calling: "One people, one draft" and "Barak, you promised – now live up to it." 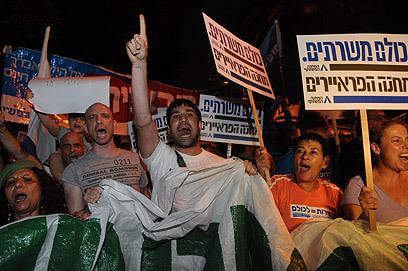 Some activists are waving Israeli flags and holding signs reading "No army – no allowance" and "equal draft – social justice." 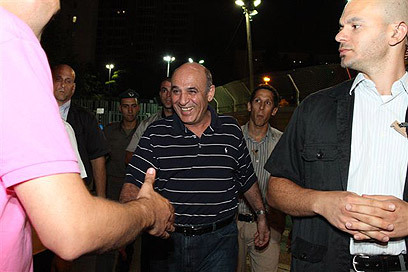 Kadima chairman Shaul Mofaz, who arrived at the rally, was greeted by shouts from protesters demanding that he "go home." 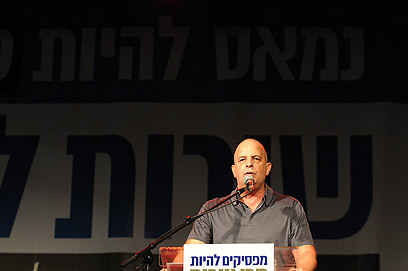 Former head of Shin Bet Yuval Diskin addressed the crowds, saying: "I enlisted into the army at the age of 18 and completed my service last year, at the age of 55. I served willingly for 37 years and never felt like a sucker. Diskin added: "Despite my age and experience, I am excited to stand here today. I see a plaza full of people who care for this country, who love it and who are willing to sacrifice for it. "There is something rotten in our leadership; we must demand that public officials not escape and not avoid acting here and now about the situation… We finally have an opportunity to fix the injustice," he said. Former IDF chief of staff Gabi Ashkenazi made a spontaneous appearance on the stage, saying "I'm happy to be here, I salute all of you." Ashkenazi said he had come from a family event, because he "couldn't not be here." Chairman of the National Student Union Itzik Shmueli addressed the crowds saying: "Netanyahu, decide – are you a politician, or a leader? "Look around you – the silent majority is no longer silent. This time we won't give up. We are not up for sale," he said. 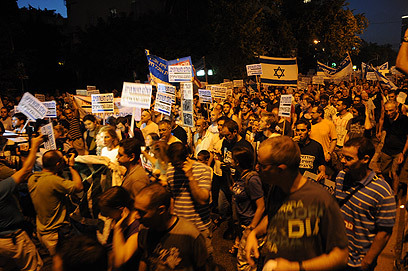 MK Yoel Hasson (Kadima) told Ynet that "it's heart warming to see so many people came here and relate a clear message: We must not compromise; we must not give up. "Kadima has raised the flag for equal distribution of the burden. We must not miss this opportunity; we will accept nothing less than the Plesner Committee recommendations," he said. Likud MK Carmel Shama, who also attended the rally, said: "We can all march and protest but only one person can lead and make the historic change. (Prime Minister Benjamin) Netanyahu won't miss the chance to make history and ensure the future of the State of Israel." 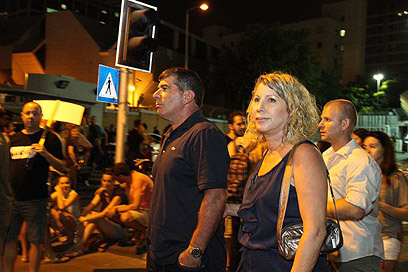 Tel Aviv Mayor Ron Huldai said he was happy to see such a large protest: "It's time things are clearly stated. Equal draft for all is a value in of itself, and its time that decisions are implemented and clearly stated – equal service for all the people of Israel." Former Military Intelligence chief Maj.-Gen. (res) Amos Yadlin told Ynet that "First of all, we must support those who serve, and then look ahead to where we want to bring Israeli society and what we want to change." "The vision of universal service is important, and that's why I'm here," Yadlin said. 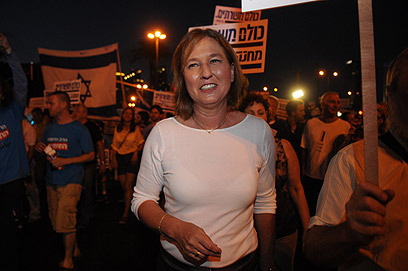 Former Kadima chairwoman Tzipi Livni also joined the protesters, saying that "this is a battle over principles and values. If Israel wants to remain democratic, it must make a decision. As a citizen of the state and a mother of a soldier, I am here with you tonight." Boaz Nol, one of the protest leaders, told the crowds that it was "the beginning of a hot summer. "We are a new generation fighting for its right for equality, for a different, better and more just society. An entire generation stands here united against all your manipulations, Mr. prime minister," he said. MK Orit Zuaretz (Kadima) added: I came here with my partner, with my nephew and parents. We came to protest the fact that we are being trampled over time and again. I have no faith in Netanyahu. We have no choice but to leave this bad coalition and connect with the people." 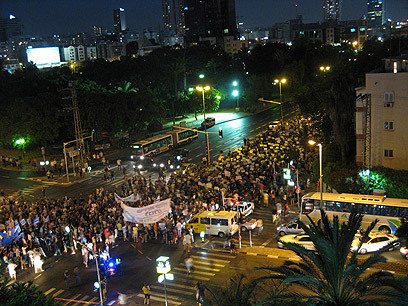 Meanwhile, the police reported that some 400 social justice activists blocked Tel Aviv's Kaplan road and staged an unauthorized protest. Some social justice activists blocked Allenby street and set on fire the signs they were carrying. Earlier, they disrupted traffic on Rothschild Avenue. Prior to the beginning of the procession, Yesh Atid Chairman Yair Lapid said "we feel as though we are being cheated by the prime minister, and we have to deal with that. "Netanyahu has to understand that his old political games won't work anymore. He needs to give answers and enact a legislation that forces everyone to serve," Lapid added. Hours before the rally, Prime Minister Benjamin Netanyahu announced that he will convene the Likud faction on Sunday morning to discuss the Plesner Committee's recommendations regarding a universal draft legislation, even though he had ordered the dissolution of the commission earlier this week. If the faction members agree to the recommendations, Netanyahu will meet with Mofaz to discuss the formation of a committee that would draft the law. Activists for an equal share of the burden responded to Netanyahu's statement saying that "(The prime minister) tries a new spin every day. "There's nothing to talk about – there are recommendations that need to be passed into law immediately," the activists said. "We don't need more members of Knesset to deal with this issue – we need leaders to make a decision. Netanyahu, we are no longer suckers. We won't accept any announcements – only actions. Tonight the Israelis who serve in the IDF, our parents, teenagers and all of us will send a clear message – there is no Tal Law 2, there is universal draft," the activists added. See all talkbacks "Protesters call for equal burden"